20 Funniest Brexit Tweets – “I am an Indian and I can tell you that the Brits take forever to leave” and other hilarious tweets regarding the monumental failure they call Brexit. Memes Only Terrible People Will Laugh At – Are you a terrible human being? Maybe it’s time to find out? Only the worst of the worst would laugh at these. The Saddest Funny Places On Google Maps – Damien Rudd is the 33-year-old Australian with the Instagram account titled “Sad Topographies”. Dan collects Google Maps screenshots of the world’s most depressing sounding places. Embarrassed Cats Are The Best Cats – Nothing is funnier than cats who’ve gotten themselves into predicaments and are sorely embarrassed about it. This gallery definitely proves it. Kids Who Totally Nailed Their Test Answers – I mean… They are not wrong… However they won’t be getting an A either, that’s for sure. Memes That Everyone Who Works In An Office Will Understand – All the motivation you need to get through another week of the daily grind. Funny And Weird History Facts – History is chock full of weird occurrences. Ready to read about some of the strangest facts and happenings from the whole of global human history? Here are 19 of them. Kissing Couple Photobombs -There is nothing more awkward than being the third wheel to a couple that can’t keep their hands off each other. Hanging out at a party while your friends are making out just isn’t any fun… unless you find some way to entertain yourself. 15 Clever Store Names That Will Make You Laugh – What’s the point of having a boring, generic store name when you can come up with a hilarious name like these people did? 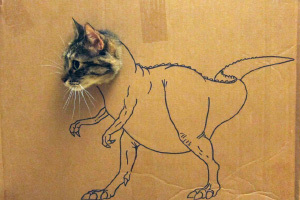 Crazy Dinosaur Cat Grooming – There’s a new trend among cat owners: dino style grooming. It’s even gaining some recognition among viral Instagram trends under #DinoCut hashtag. What do you think? Unacceptable or funny? Still bored to tears and want to see more funny links? You should check out Leenks.